Nominations are open for the 2018 David Black Award, which recognises people who have made ‘important and sustained’ contributions to the pig industry. The annual award, sponsored by AHDB Pork, was won last year by Oxfordshire farmer and founding member of Thames Valley Cambac, Charlie Allen (pictured). The award has been running since 1960 and previous winners have come from all parts of the industry, including producers, processors, academics and the allied industry. You can enter a nomination for the 2018 winner here: pork.ahdb.org.uk/news/david-black-award The closing date for nominations is Friday, August 31. 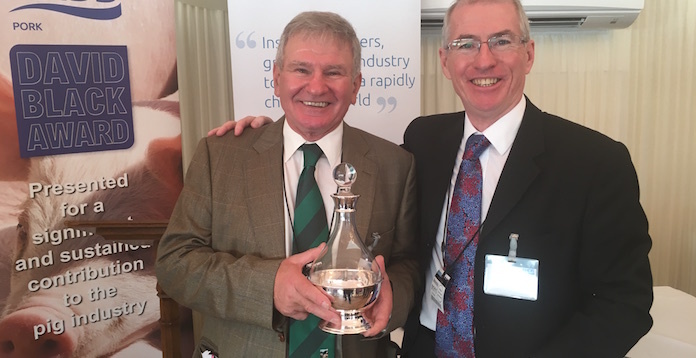 AHDB Pork strategy director and chair of the independent judging panel, Angela Christison, said: “More than 50 years ago East Anglian pig producer David Black created the award that bears his name and it is as relevant now as it was then.